Did you check out the projects posted in last month's party? They were ALL inspirational. I want to try each and every one of them. 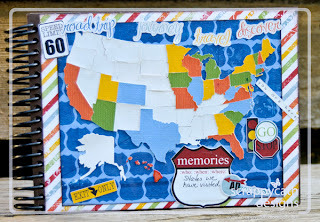 The US Map shape is really cute in this travel album. I like how the states they've visited are in color and the other ones are white. Silhouette Free Shape Link Party! 5. The party will be open for one week to link up. It will close the Thursday after it opens. 6. You must specifically link back to my site within your blog post or on the SAME page as the photo you link up. There are two button sizes and a banner with their links for you to choose from. 7. I will reserve the right to remove any links (be it inappropriate, marketing, or otherwise). 8. If you link up please check out the other projects linked up and comment on them. If you are interested in promoting your business (Silhouette related) by sponsoring rewards for the SFS Link Party or by having your business highlighted in the link party post, please feel free to contact me. Start Linking up those projects. Of course, you have a week to get things done, so take some time this weekend and make something new!